In the aftermath of the January 7th terrorist attacks on Charlie Hebdo magazine in Paris, I feel obliged to voice my support of satire as a cultural genre. Thinking about this article for a while, I went back and forth between writing a dedication to satire and a dedication to France through an analysis of Delacroix’s Liberty Leading the People. Though Delacroix’s Liberty is an iconic masterpiece, I am more inclined to pay tribute to satire, as this was and is Charlie Hebdo’s purpose. I am not familiar with this magazine, nor do I speak French, and like many Americans had only heard about it after the violence that took place on January 7th, when terrorists entered its offices on a shooting spree in retaliation for past satirical depictions of the prophet Muhammad the magazine had done. After the attacks, it was surprising to hear so many comments warning about the dangers of satire and the consequences of parody circulating the news. While you may not agree with what Charlie Hebdo had to say or think their controversial caricatures are funny (and I’m not saying I do), it is the freedom of speech and press that must be defended. Terrorists seek to oppress such freedoms, using violence as their tactic to enforce. Contrary to naysayers in the aftermath of the Paris attacks, I believe in the beauty of satire and the power it has to roast the people at which it is directed. This type of dark humor has been around for centuries, and Charlie Hebdo has proven, in its resilliance after these attacks, that it is not going anywhere. The attempts of terrorists to shut Charlie Hebdo up backfired in the most beautiful way. Not only did the magazine still publish their scheduled issue just days after the attacks, it had the balls to portray a new caricatured Muhammad on its cover (yikes). It sold seven million copies in six different languages, contrary to its usual 60,000 prints in French only. Moreover, just 4 days after the attacks when terror alerts were still high, more than two million people had the balls to rally in the streets of Paris and march united for peace, issuing a collective middle finger to the terrorist groups behind the attacks. Not only are they afraid, but they certainly don’t have a sense of humor. This is another reason why satire is such a beautiful thing. I believe a sense of humor is a significant piece in the large puzzle of pieces that make up the human soul. The ability to laugh at oneself, moreover, is one of the best qualities I think a person can have. And if you think that God doesn’t have a great sense of humor, you’re crazy, and that’s something that people who uphold terrorism may not have considered. We Americans are familiar with many contemporary satirical outlets, such as The Onion, ClickHole, The Daily Show, The Colbert Report, and my personal favorite, Last Week Tonight with John Oliver. And if you’re a sports fan and haven’t checked out Sports Pickle, well, you’re just missing out. There are also the important literary works we grew up learning, such as Jonathan Swift’s Gulliver’s Travels, Thomas Moore’s Utopia, and the greatest novel of all time, Don Quijote, by Miguel de Cervantes. Satire is a staple in the cartoons of our local newspapers, as are political cartoons in nationally circulated newspapers and magazines. Even the ancient Egyptians and Greeks included satire in their writings. Art and illustration has been abundant with satire over the centuries, especially with works on paper. 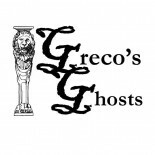 If you’re a follower of this blog, you know who my favorite artist is. Goya himself was a satirical genius. Click image to enlarge. Francisco de Goya (Spanish) Los Caprichos, plate 23, Aquellos polbos, “Those Specks of Dust,” 1797-99, etching, 306 x 201 mm, Museo Nacional del Prado, Madrid. Click image to enlarge. 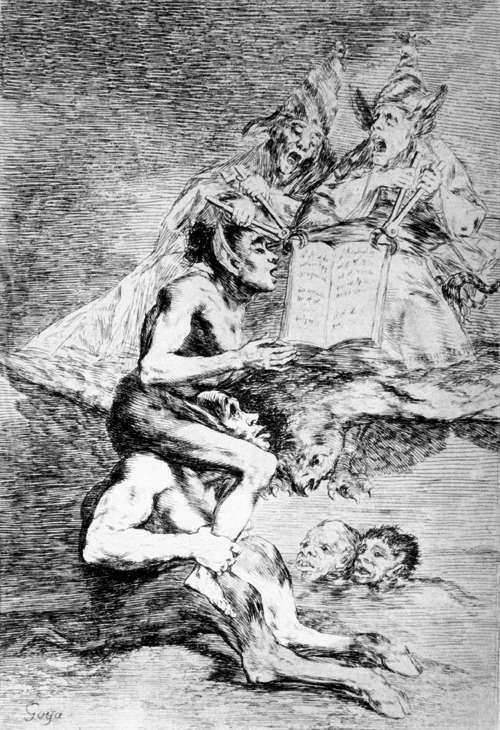 Francisco de Goya (Spanish), Los caprichos, plate 70, Devota profesion, “Devout Profession,” 1797-99, etching, 306 x 201 mm, Museo Nacional del Prado, Madrid. Click image to enlarge. James Gillray (English), Plum Pudding in Danger, 1805, illustration. The political cartoon has been around for ages. 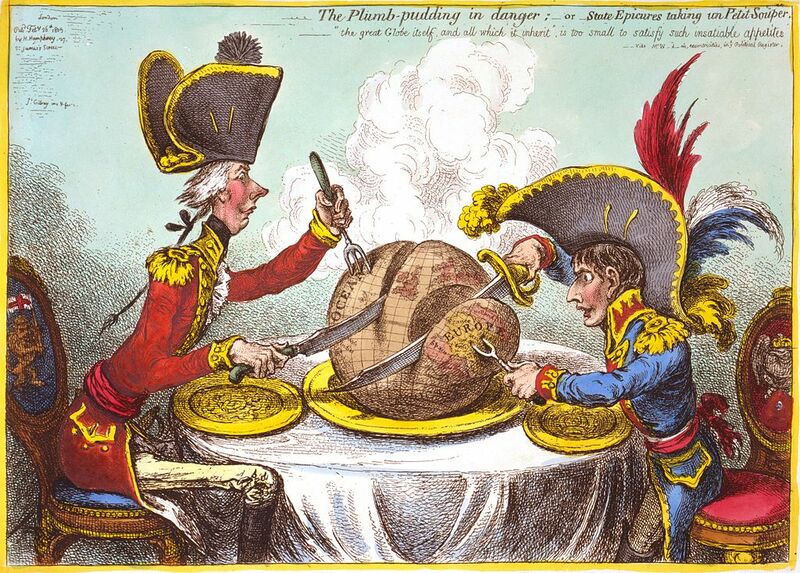 The above illustration parodies British prime minister Pitt along with Napoleon Bonaparte, eagerly slicing off pieces of the world, which they wish to devour. Click image to enlarge. 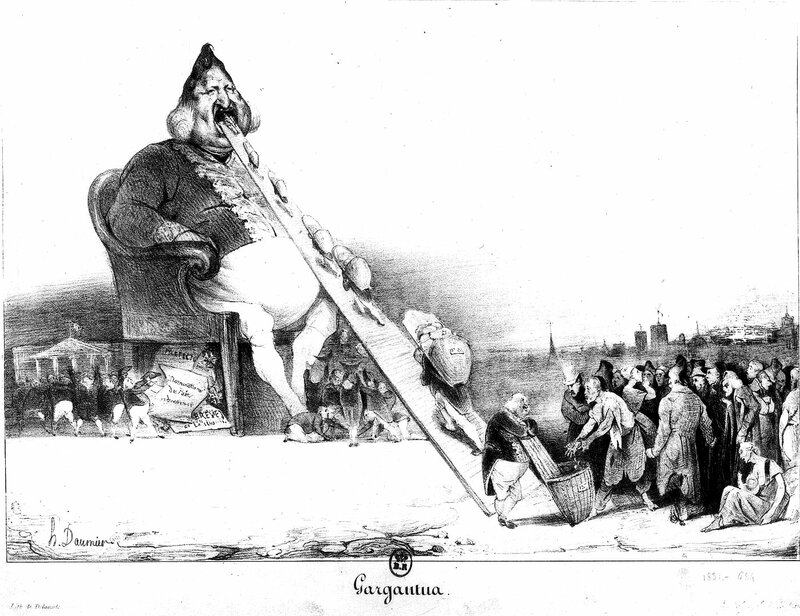 Honore Daumier, Gargantua, 1831, lithograph, Bibliotheque Nacional, Paris. 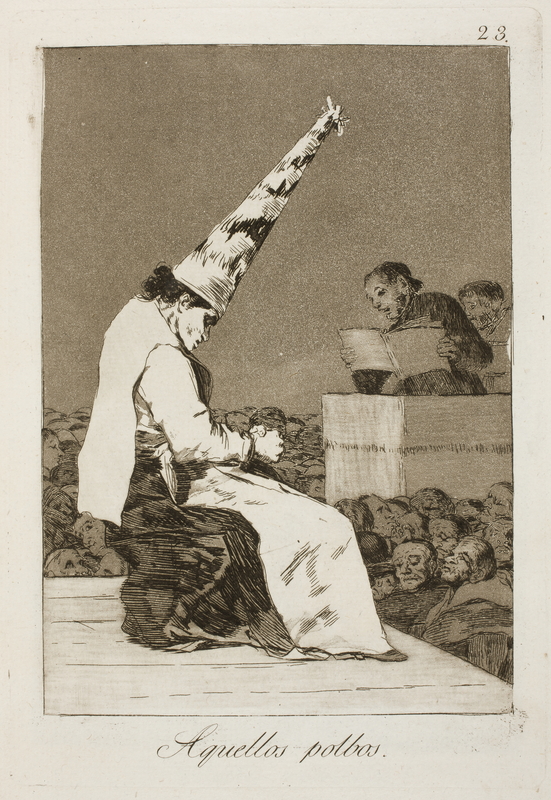 Another jab at a political leader, this time from Frenchman Daumier whose satirical illustrations, like Goya’s, were often targeted at the follies and vices of the bourgeoisie. The above caricature of king Louis Philippe landed Daumier in prison for six months, the poor fellow. Click image to enlarge. Charles Philipon (French), Le juste milieu, c. 1830, lithograph. Another political jab above comes from Daumier’s contemporary Charles Philipon. 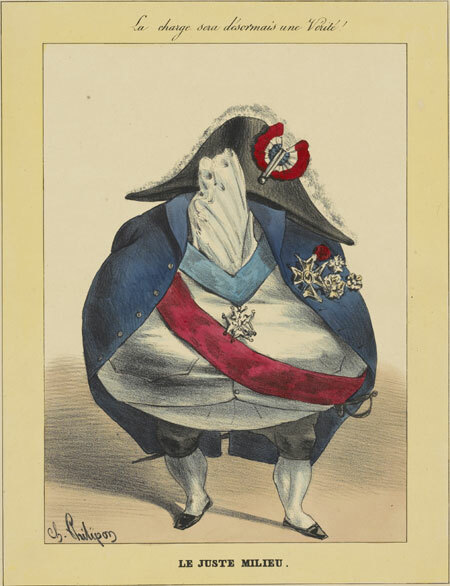 In this illustration he portrays France’s juste milieu philosphy, the concept of finding a balance between political extemes, as just a fat empty suit. Again I’ll only point out that any attempt to opress a good, sarcastic sense of humor is futile. History proves it. Just sayin’. End rant. I totally agree with you, Kristy. Thanks for sharing. This entry was posted on January 30, 2015 by KristyDurk in British, Contemporary, Eighteenth Century, European, French, Illustration, Literature & Mythology, Modern, Nineteenth Century, Print, Spanish and tagged Bonaparte, caricature, Charlie Hebdo, Daumier, Dumbledore, France, Gillray, Goya, Harry Potter, illustration, juste milieu, literature, Louis Philippe, Muhammad, Paris, parody, Philipon, Pitt, print, sarcasm, terrorism, violence, Voldemort.